Southern Scotland encompasses the lush green countryside of the Scottish West Coast, and the area that is the border between England and Scotland - the scene of many bloody battles and raids. Edinburgh, Glasgow and Stirling are the main towns in the region. Edinburgh is the capital of Scotland and the home of the new Scottish Parliament. It has a contrast between the old Castle, tenements and the Royal Mile, and the New Town - a model town built in the Georgian era. Glasgow was traditionally the industrial centre of Southern Scotland, although it has a lot of attractive Victorian architecture and many fascinating museums and art galleries. 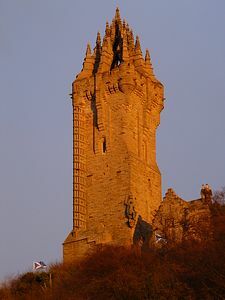 Stirling is called the "Gateway to the Highlands" - it is dominated by its Castle on one side of the town, and the Wallace Monument on the other. There is a long history of fighting over the Scottish / English border, with many tales of skirmishes and raids on either side. However, the Borders region is now more peaceful, with many beautiful views of the forests and rivers, and numerous castles and country houses such as Smailholm Tower, Castle Campbell, Caerlaverock Castle, Traquair, Lennoxlove House, Mellerstain, and Floors Castle. The area is famous for its textile industry centered around mills on the River Tweed. The Tweed is also well known for salmon fishing, in the season. 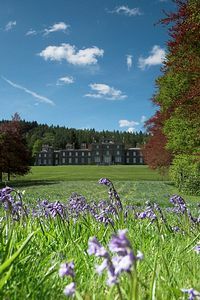 The area has a strong association with Sir Walter Scott - many of his novels were based here, and he built his home at Abbotsford House near Melrose. Southern Scotland is famous for its abbeys - there are many magnificent ruins to be found, especially in the Borders region, such as the remains of Jedburgh Abbey, Melrose Abbey, Dryburgh Abbey and Glenluce Abbey. Loch Lomond lies to the north of the region, with its rugged scenery at the northern end of the loch and less-dramatic scenery with green mountains at the south. The loch is the subject of the famous song "Loch Lomond", said to be written by a follower of Bonnie Prince Charlie on the eve of his execution. The south-western part of this region is called Dumfries and Galloway. 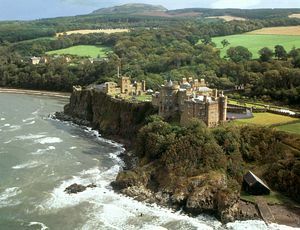 It is much warmer than the rest of Scotland due to the effects of the Gulf Stream, and so boasts particularly green and lush countryside, with some famous gardens, for example the gardens at Culzean Castle. Robert Burns, Scotland's most famous poet, was born in this region, and many of his poems feature the area. In the east of the region, you will find the golfing centre of St Andrews - it is the headquarters of the Royal & Ancient Golf Club (the game's governing body) and is the location of the Old Course - one of the Worldís most hallowed golf courses. St Andrews also boasts the remains of the largest Cathedral in Scotland, and the Preservation Trust Museum which aims to preserve the history and character of the town.